To what extent did the 1986 People Power Revolution inspire the recent upheavals in the Middle East and North Africa? This was the question asked of panelists during the "Philippine People Power Goes Global" forum at the Liberal Party Headquarters. "Because of recent people power events in the Middle East and North Africa, there has been increasing interest in the Philippine experience," according to Mr. Jules Maaten, Country Director of the Friedrich Naumann Foundation for Liberty, Philippine Office. Hon. Chito Gascon, an active participant during People Power I, said that he was taken back to when he was a youth leader by the images he saw of Tunisia and Egypt. "In a personal way, I could identify what was happening." 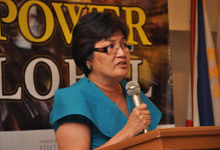 "Philippine People Power also draws inspiration from previous events. 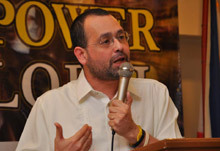 Prior to this, there were similar initiatives of facing power with truth and violence with non-violence," Gascon added. "But Philippine People Power is one of the first models that succeeded and the reason the Philippine case has gone global is the succession of similar events that followed, including the Velvet Revolution, Orange Revolution, Tulip Revolution and Reformasi in Malaysia and Indonesia." Dr. Benjie Tolosa of the Ateneo de Manila University described people power as a struggle for social and political-economic democratization, a non-violent struggle and an unfinished struggle for genuine democracy. At the same time, he stressed the importance of building a successor generation in order to defend and deepen democracy today. In following the call for ipagpatuloy ang laban (continue the struggle), young people should be given more leadership roles, mechanisms and multiple venues to engage in politics. "People power should be viewed as a work in progress, rather than a project completed. This has been true in the Philippines, and this would also be true for recent democratizers like Tunisia and Egypt," added Congresswoman Dina Abad. "They need to be oriented on building institutions that really work, so that the gains that the revolutionaries worked so hard to achieve would be preserved." This forum was organized by the Friedrich Naumann Foundation for Liberty and Council of Asian Liberals and Democrats together with the National Institute for Policy Studies as part of the "Road to Manila Congress", a series of forums in preparation for the Liberal International 57th Congress on Human Rights and Trade. The next forum, "Did the Philippines Sacrifice Human Rights in the Altar of Free Trade?" will bring together Chairperson Etta Rosales of the Commission on Human Rights, Prof. Felipe Medalla of the Foundation for Economic Freedom and Sen. Wigberto Tañada, Chairman of the Philippine Working Group for an ASEAN Human Rights Mechanism on Thursday, 26 May, 4-6pm at the Ateneo Rockwell. This activity is open to the public. For more information, please contact Pauline Sanchez at 0920-9158428.